The powerful springs of Banjiste spa-resort, with a total velocity if 70 l/s, are located northwest of Debar at a height of 740 m near the village Banjiste. This spa-resort is famous for its radioactivity and healing properties. 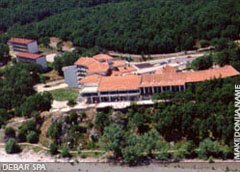 The chemical composition of the Banjiste thermal-mineral water, the water content, the numerous rare elements, hyper-thermality, the content of the dissolved gasses (carbon dioxide and H2S) and the high radioactivity of 26,75 moch units include this spa-resort in the most renowned worldwide. Drinking, bathing in and inhalation of the water is thought to cure all kinds of chronic rheumatism, lumbago, women's genital diseases and infertility, skin diseases (eczema, psoriasis, and fungal diseases), ulcer, gastritis, urinary diseases, light forms of diabetes, bronchitis, conditions after children's paralysis, weakness of the muscles and stiffness of joints after fracture. Several hotels and swimming pools as well as facilities for physiotherapy are included in the Banjiste spa-resort. Direct bus lines connect the Banjiste spa-resort to Debar and onto Skopje, Tetovo, Bitola, Ohrid and Struga.